YOGA JEWELS seemed to evolve naturally from artist Erwin List and yoga instructor and acupuncturist Deborah Stotzky. Using the lost wax process, Erwin began to play around with the forms & shapes he saw during Deborah’s daily yoga practice…in the middle of the living room of their small Chelsea apartment. Deborah quickly became aware of these graceful, fluid and strong miniature “yoga people” that kept popping up around the apartment and started to like what she saw….the mash-up was born. Erwin cast the pieces in sterling silver and Deborah brought them down to Mexico for a yoga retreat she & two friends give yearly. The necklaces sold out and they pondered “ya think we got something here?”. The collection has expanded to include earrings & bracelets and new miniature “yoga people” appear regularly. The first piece ever made was the Wheel Pose – a pure expression of an open heart. Erwin and Deborah hope that the pieces are not only beautiful to wear, but inspiring for practicing yoga and living life with an open heart. Each piece is handmade and alive with this spirit. Erwin makes art in various mediums and sizes such as large scale animals welded from large concrete nails, colorful paper mache Alebrije (mythical creatures), and bronze castings. Deborah is an acupuncturist with a practice in NYC. She teaches yoga and Yamuna Body Rolling in weekly classes, workshops and retreats. She and two other yoga instructors host a yoga, body rolling & acupuncture retreat in Mexico annually. 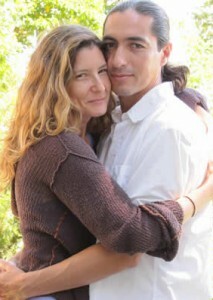 To learn more about Deborah please visit: www.AcupunctureAndHotstones.com. Visit ITunes to subscribe to her free yoga podcasts.